Kreuzspitze solved boot-crampon compatibility problems in the first try. Made to fit in your ski boot’s tech inserts, these aluminum crampons are perfect for glacier travel and ski mountaineering. The Italians used a cable system for boot sole length adjustment, which enables a perfect fit down to the millimeter. Because of the cable, you can fold them in half to make them very packable. 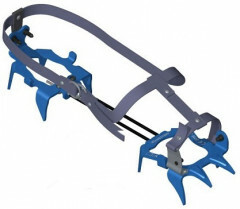 The crampons are works of art, just like the Kreuzspitze bindings. 10 points with Ergal aluminum construction. Inox cable connection is strong and flexible. Dyneema strap system for easy on/off. Uses tech fitting for ultimate boot compatibility. Are these any better than CAMP's attempt at this concept years ago? They used a bail in the front and I could never get them tight enough in back to hold them securely. This cable system may allow for a more precise fit, something missing on the CAMPs. Love the idea but it was a fail. Just came across them on my gear shelf. Funny I should be reading about these a day later. Hi Brian, since you can pry the toe wings open it should be easier to put on. The trick with the CAMP version is to insert the heel pins first and then pry the front bail on with your Whippet. My Whippet........that's funny. But I get what you're saying. Never tried that.